Complete the vintage look with Fuschia products and styling. Photo by Caroline Gue CP Photography and Flowers by The White Horse Flower Company. With the vintage trend becoming more and more popular, brides are looking for traditional afternoon tea to be served for their wedding breakfast. To accomodate this trend, we are really excited to share with you that, Rivervale Barn in Yateley and Wasing Park in Aldermaston, have just launched a wedding afternoon tea menu. Both venues offer traditional afternoon tea with a twist, drinks package and complimentary tea, coffee and petits fours. Please contact the venues direct for full details and prices. Vintage Wedding table, products designed and styled by Fuschia at Wasing Park, Aldermaston. Photo by Caroline Gue of CP Photography and Flowers from The White Horse Flower Company. We love the sound of some of the menu options, such as hot smoked salmon, caper berries on toasted rye bread as a sandwich filling. Parmesan and sun-dried tomato muffin, mini quiche such as goats cheese and pesto with crisp rocket. For dessert a couple of our Fuschia’s favourites are scones with clotted cream and strawberries and triple chocolate brownies!! 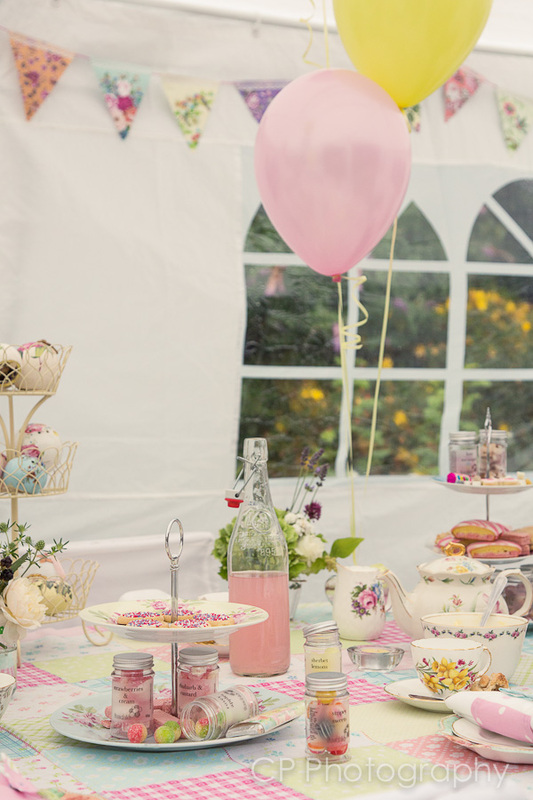 These yummy afternoon tea menus need a little vintage touch, to create the most perfect quintessential English wedding, so this is where Fuschia can help! As a recommended supplier for both of these beautiful wedding venues, we would love to be able to help style your vintage wonderland. 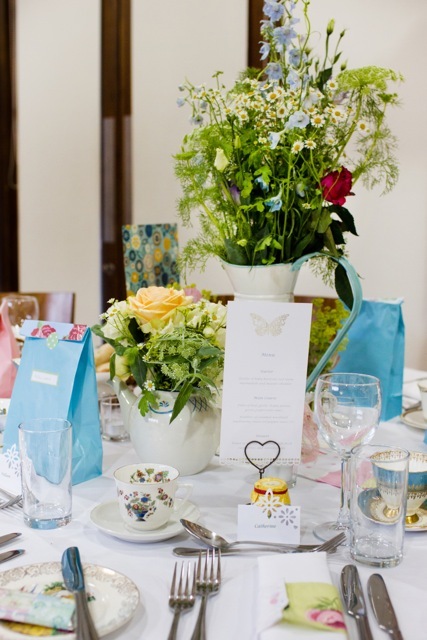 Hire vintage crockery and accessories from Fuschia to display your afternoon tea. Photos by Caroline Gue and Flowers by the White Horse Flower Company. Hire our original vintage crockery to present beautiful food on stunning tableware to your guests. Vintage crockery hire includes cup and saucers, side plates, cake stands, tea pots, sugar bowls and tong and vintage milk jugs. 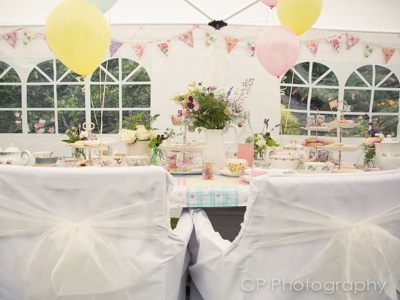 For extra decoration we have bunting, vintage fabric table runners and matching napkin wraps, vintage wedding favours and vintage themed table stationery. These include: personalised place names, table plans, table names and menus. We can print your special afternoon tea selection in a beautiful printed menu. 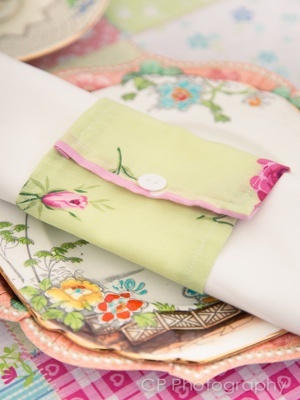 Beautiful vintage fabric napkin wrap by Fuschia. Adds a vintage touch to your wedding table. Please feel free to contact us for prices or to book a vintage style appointment at our Wokingham design studio on info@fuschiadesigns.co.uk or call us on 01189 773 931. This entry was posted in Key Trends, Vintage Inspiration, Wedding & party Trends, Weddings and Celebrations and tagged afternoon tea menu, Aldermaston, Fuschia, Fuschia vintage weddings, Menu, Rivervale Barn afternoon tea wedding menu, Tea, vintage crockery hire berkshire, vintage crockery hire for afternoon tea menus, vintage crockery hire hampshire, vintage weddings, vintage weddings by Fuschia, Wasing PArk afternoon tea wedding menu, Wedding dress, Wedding favors, Weddings, Wokingham on January 18, 2013 by fuschiadesigns.